I packed up and quietly wheeled my boat to the boat landing, and launched nearly an hour before sunrise. 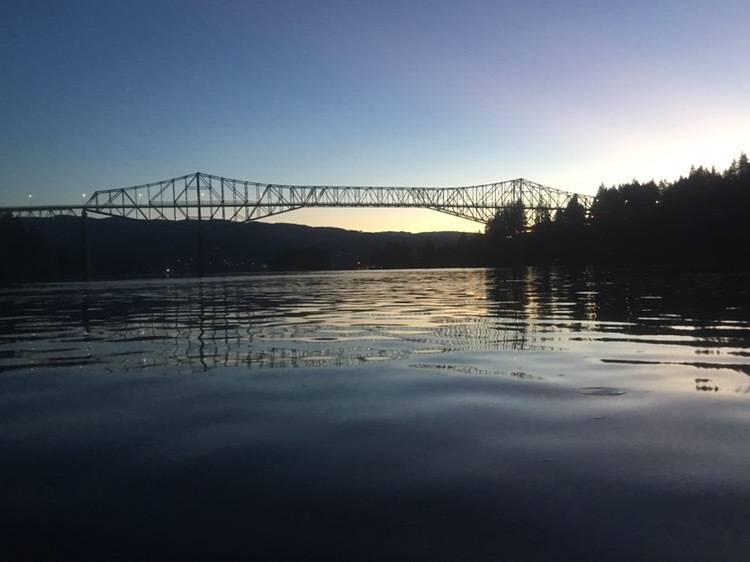 I paddled beneath Bridge of the Gods, leaving my headlamp on in case an early salmon fishermen would come motoring down the river. As I approached the south end of Bonneville Dam there were great numbers of salmon fishing boats and bank fisherman. I scouted out the portage route one of the Corps of Engineers people had suggested and I wasn’t enthusiastic about it. I would have to scramble up a steep bank with all my gear and boat and a huge crowd of fishermen rubbernecking at me. After a short distance wheeling my boat I’d have to take everything apart to haul it up a set of steep stairs. I decided to paddle across the river in try the route I had planned for myself. I landed near some fish platforms. There was no mob of people and it was easier climbing the bank. After getting everything packed into the boat and putting the cart on I wheeled down a very bumpy dirt road for a quarter mile before getting up on the paved road. There was a nice wide shoulder and pulling the boat was a piece of cake. I had a route path on my phone that I had drawn with Google Earth. The Bonneville dam guard shack was close enough so I yelled down to the guy to ask where the boat launch was. He said about 2 miles. That was probably the place I had plotted. I put my kayak in the water off to the side of the boat ramp and was loading my boat when a salmon fishermen asked if I was planning to launch, in a smart-alecky fashion. It made me slightly grumpy because I wasn’t dawdling and I wasn’t blocking the ramp. There must have been a hundred fishing boats in the next mile, and, incredibly, a good current, the first good current since Lewiston. Also hard to believe is that one boat actually slowed down to decrease his wake. These fisherman, though, were considerate, skilled boaters compared to the Bismarck Memorial Day crowd! For the first five miles or so I was flying, and I had some current for most of the day. It made a big difference. The wind held off nicely and the miles rolled by. The only downside was speeding fishing boats. One boat rushed up to chastise me, he had barely seen me! I should put up a flag or something. “Maybe you should pay better attention,” I said. I was after all, in a red and white boat with a wet double-bladed red paddle that was waving almost constantly. On this sunny day the blade glints could probably be seen for two miles. The scenery was wonderful with some impressive rock formations. Many people were out, swimmers and picnickers as well as fisherman. One island had many people getting full body tans. On the edge of Portland were some floating two story houses that apparently were anchored to pilings in such a way that they could slide up and down with the water levels. Towards the end of the day there were great views of Mt. Hood, now to the east. I made about 40 miles today. This evening I am on the island L&C camped upon on November 3.